A 2-year-old girl who was the first child to receive a windpipe grown from her own stem cells died this past weekend, Children's Hospital of Illinois said in a statement Monday. Hannah Warren would have turned 3 years old on August 22, according to the hospital. "Following her successful, pioneering trachea transplant surgery on April 9, 2013, and despite all efforts, Hannah was unable to overcome additional health issues that were identified as her care progressed," the hospital said in a July 8 statement. "Our heartfelt sympathy goes out to the Warren family. We have been blessed to get to know and support them during Hannah's journey over the past few months, and it's a personal loss to the OSF family." CBS News chief medical correspondent Dr. Jon LaPook first reported on Hannah's surgery last April (video above). The girl had been born in 2010 without a windpipe and had been unable to talk, swallow or eat on her own. Doctors had told the family she wouldn't live past age 6, and the only thing that might help was an artificial windpipe -- which had only been tried on five other patients at the time, none of whom lived in the U.S. or were children. Her medical team designed a tube using tiny plastic fibers for scaffolding, which were then bathed in her own stem cells taken from bone marrow. 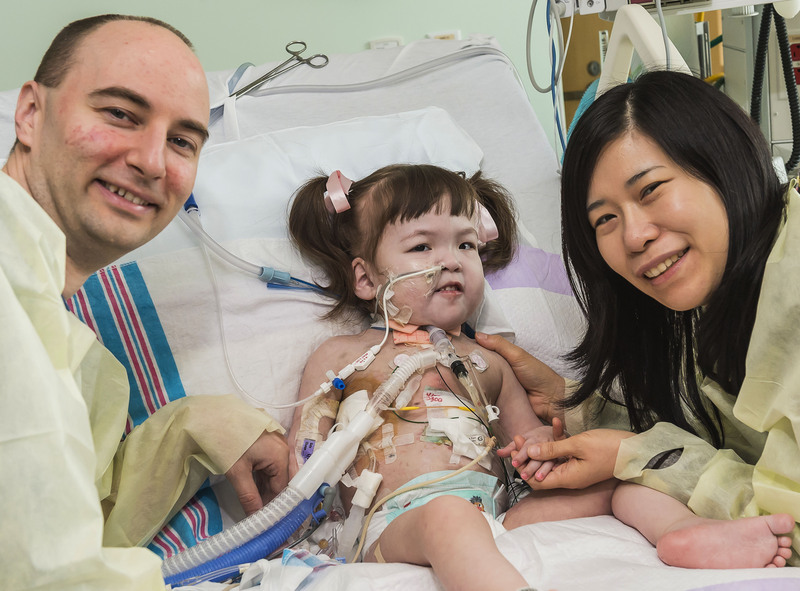 The nine-hour surgery took place April 9, and she was able to breathe on her own for the first time after. The Associated Pressreported that Hannah's parents had read about Dr. Paolo Macchiarini's success using stem-cell based tracheas but couldn't afford to pay for the operation at the doctor's hospital, Karolinska Institute in Stockholm. Macchiarini first successfully performed this surgery in 2011 on a 36-year-old Eritrean man. One of Hannah's doctors, Dr. Mark Holterman, an associate professor of surgery at Children's Hospital of Illinois, helped the family arrange to have Macchiarini brought in to lead the operation, according to the AP, and the hospital waived hundreds of thousands in costs. The surgery was completed after two years of planning, paperwork, travel arrangements and staff education, according to the hospital. Holterman, who had been involved in Hannah's care since he met her in South Korea when she was only one month old, told LaPook in April, "Lately it's just been kind of fun, kind of watching her to learn how to live without a tube hanging out of her mouth. So now her lips are together she's learning about her environment with two new senses, before she never tasted and she never smelled," he said. LaPook reported Monday the doctor was grieving the girl's death. "This poor little girl is a pioneer," Holterman told LaPook for CBSNews.com. The surgeon said Hannah had developed a leak in her esophagus, for which she was taken back to the operating room. Complications of that second operation resulted in lung failure and her death, the surgeon said. However, Holterman pointed out that despite the multiple complications, the artificial trachea itself was working well. His medical team plans to continue researching regenerative medicine to improve the lives of patients such as Hannah. "Our hearts are broken," Hannah's parents Darryl and Young-Mi and her older sister, Dana, said on the family's website Saturday. "We will forever miss her infectious personality and miraculous strength and spirit. Born without a trachea, she gave us over 34 months of ever-lasting memories. We are humbled and blessed." Children's Hospital of Illinois has more information on Hannah's story.